Test for the mesh. I’m really not satisfied how the mesh looks at all (as expected). 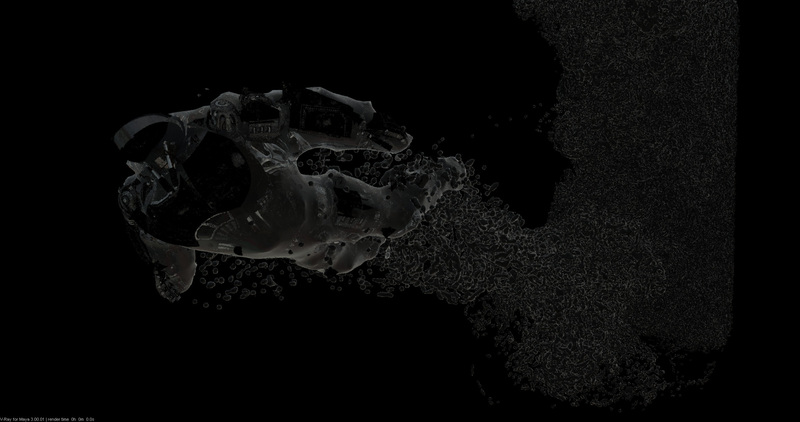 Meanwhile I’m doing this sim in Realflow and Houdini, posting those results later! 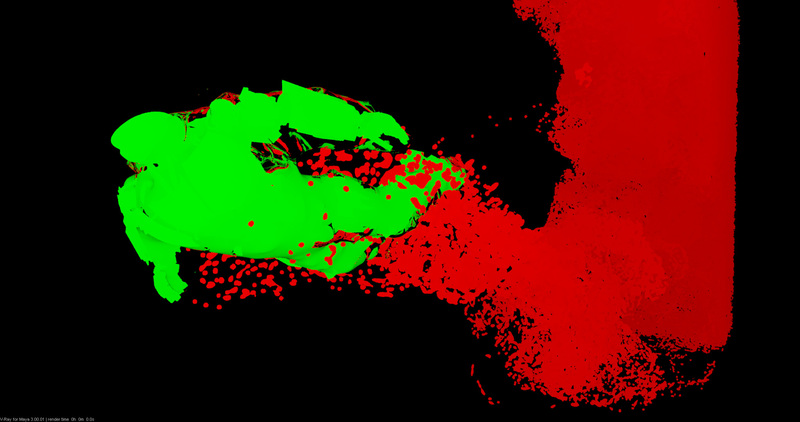 3.8 Million particles approximately. 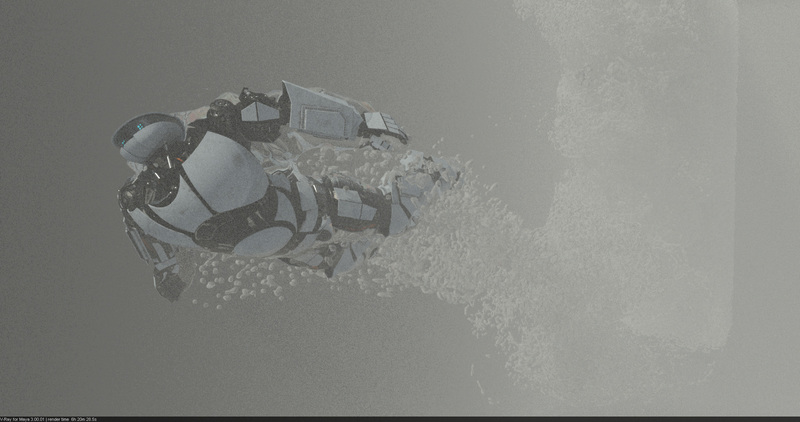 Changed gravity to reduce the explosion of the water when exiting. Oke, I was busy setting up a sim in Houdini. I broke the robot once again, in a cool way though. I’ve just started learning Houdini 14, this is the default ocean. Pretty impressive result for just drag and drop. So I’ve setup backburner to optimally use our 6 workstations to use overnight because most of them don’t do anything during the night! Now that I have these heavy underwater scenes with fog, water and lots of reflections and refractions going on the render times are going up. So why not use available equipment?! Believe me it took me a lot of hours setting this up. Finding the right solution for every problem that the backburner log gave has been hell. Setting the right share folders, firewall rules, path translations, vray command, task timeouts all gave me problems… But now it works! Here’s a quick overview on what to do. This goes for Maya and V-Ray. Setup one workstation as manager. (Can be slave too but not recommended by the manual). Setup the rest as slave. Make them point towards the manager within the application. Scene has to be in a shared folder, reachable by all slaves. Set task size to 1 (each task will contain only 1 frame, otherwise one computer will i.e. render 10 frames and move on to the next task). Check Use Custom Command and click Populate Command. So the last week I have been busy getting the correct render elements out of V-Ray. This has been so hard because the actual water polygons are sometimes covering the robot which blocked some of the render elements. 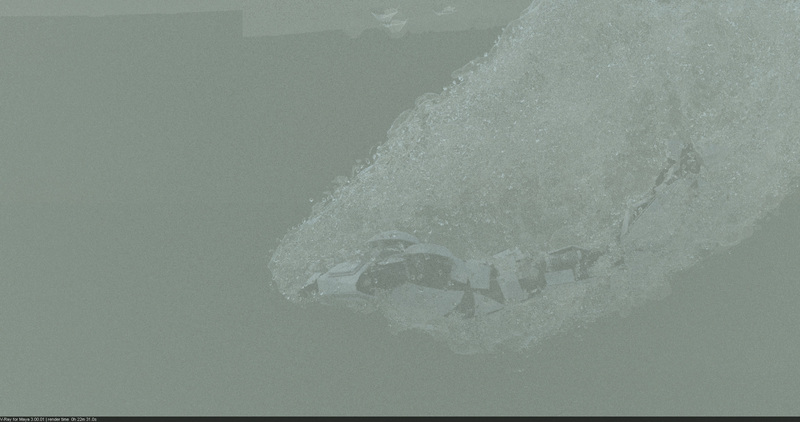 For example, my multimatte channel didn’t appear refracted as the water contains this effect. However there is a nice little setting in the V-Ray material under “Affect Channels”, when you set this to “All channels” you actually get your refractions in the render elements as well! Now you can see in the multimatte pass that the green from the robot is refrected as well. Another hard part was getting the velocity pass correctly. I saw a tutorial a while ago on how to get a stitched realflow alembic file into Maya and render it with motion blur. 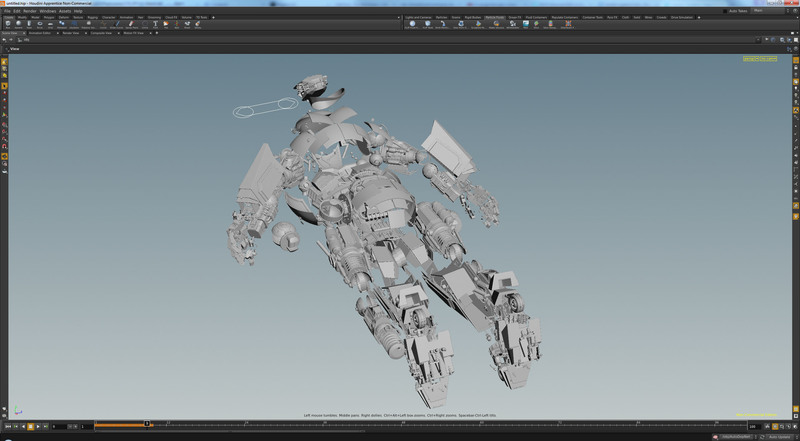 I used this same workflow to get the velocity pass from the mesh. If you import the alembic via the alembic pipeline you do not get any data like velocity, motion blur and viscosity etc.. This video explains how to do so. What happens is that once you have your simulation and meshing done in Realflow you can export them as a .abc (alembic) file. 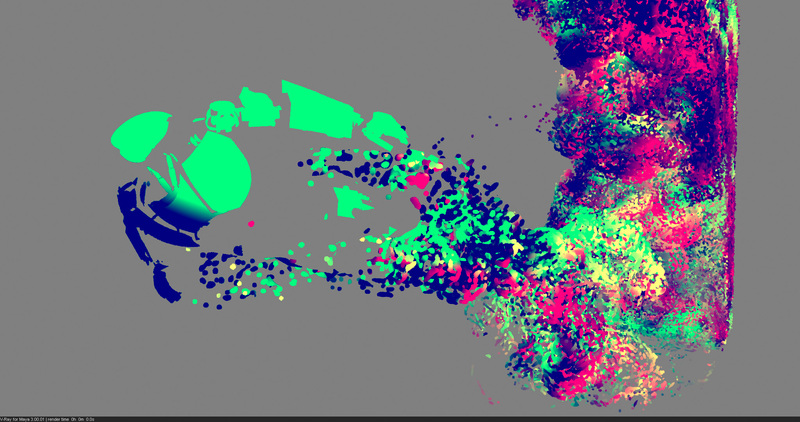 Within Realflow you can stitch all these seperate alembic files into one big alembic file. 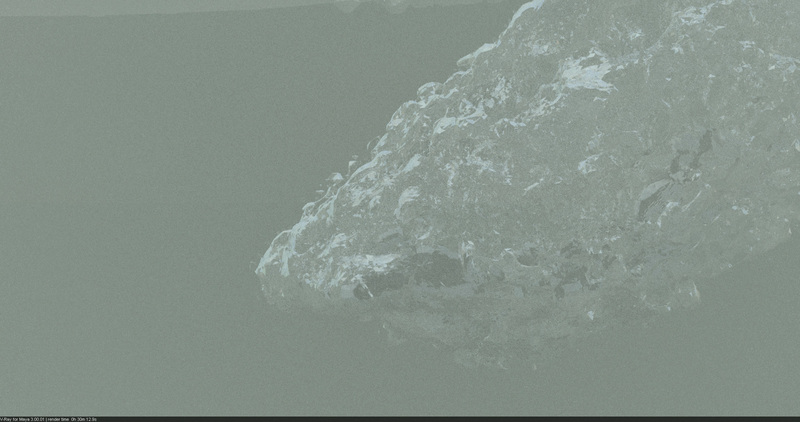 Then inside Maya you import them as a V-Ray proxy and give them a shader. Because it is a V-Ray import you get the additional data from the stitched alembic file (which contains data like velocity). The picture above does not contain the correct velocity pass, because they are being rendered out right now. The correct velocity pass is already tested and underway! Some of the last rendered frames of the old animation, was still testing the shaders. I received the final animation. The camera angle changed for this scene.